Both kids participated in the Upward league last winter. It was a fun experience for all involved. Highlights are here, here and here. Ryan was baptized in January! We were so excited to see him make this commitment. Details are here. I turned the big 4-0 this year. In spite of being sick the week of my birthday, we still managed to have a little fun—and sneak in an Austin trip—to mark the occasion. Photos and stories are here. The photo of Katie rock-climbing is from the Fourth of July. More pix from that outing are here. We also did some real "mountain climbing" this year when we visited Hot Springs, as you can see here. While we sometimes reminisce about our long-gone toddlers, we love that the kids are old enough to participate in more vigorous activities now. We had a couple of "snow days" this year. We had one night of snow, and then there was a drive home in snow. The real fun came when we had enough snow accumulated to create some pals in our yard. (We might've gotten a little carried away.) Snow photos are here. And then there was our other "snow day" when my school district closed after a wind storm because of massive power outages. Regular readers know that we Dubs have a ton of random traditions. One such tradition is heading to Baskin-Robbins after certain school programs. Katie's picture is from our post-choir festival celebration. We seem to have a thing about going out for food after performances! Photos are here. On the card, Ryan is celebrating his success in our family Easter egg hunt. (He found the "bad egg.") On other fronts, though, the kids celebrated success in school (spelling bees and the like) and at home (pwning me in Guitar Hero). Brett successfully completed volume 2 of Classic Home Video Games, and it was fun to collect a couple of royalty checks from his first book. Of course, he really enjoyed getting to meet other gamers at local signings and other events. As a family we also marked Brett's parents' golden anniversary. The celebration, though tinged with sadness, was another of our successes this year. We have loved having our own pool, and that's where you could find us for most of the summer. This year, however, we started our swimming season just a tad earlier than usual. We also hosted our 12th annual swimming party for Ryan's birthday. Who would've guessed the silly little rubber duckies I threw in the pool would be turned into projectiles? Swimming photos are here. We didn't plan any big trips this year, but we did manage to sneak in some time in Hot Springs, Arkansas. We also spent more than a couple of summer days at Six Flags, and on one crazy Saturday, we took a day trip to the Fort Worth Stockyards. The kids and I had a "big day in Big D," and for yet another mini-vacation, a friend and I headed west to celebrate a football buddy's 40th. These vacations are chronicled here. Katie attended Camp Impact in June, and then Ryan and I were at Camp Cornerstone in July. Both camps are on the Oklahoma Christian University campus, and both were rewarding! From my stint as a dorm mom at Ryan's middle school camp, I could tell how much fun the campers get to have and how much they learn. Some photos from our OC experiences can be found here. Frisco came to live with us this summer! She was a stray when she stole Brett's heart. The dog is flat-out crazy, but she's found a home with us. The story of how she came into our lives and some photos of her exploits are here. Unfortunately, soon after Frisco arrived, KitKat departed. ChaCha's still here, though, so we have the matching set of black-and-white pets. For the 23rd year in a row, I had season tickets for Texas Longhorn football. The games and tailgates kept me entertained all fall (except for that one November night). The Texas-OU game and the State Fair were especially fun. (The BCS might not remember it, but Texas won, 45-35.) Ryan and Katie got to go to two games with me this year, and as always, their presence made those weekends extra special. Football and tailgating photos and a couple of rants are here. 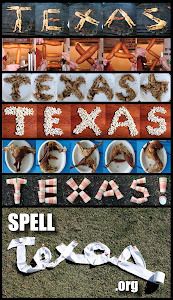 You'll also find all the times we spelled TEXAS with food at that link! The photo depicts Ryan and Katie's Halloween costumes, but on this site are accounts of other holidays, too: New Year's, Valentine's Day, Mardi Gras, Easter, Mother's and Father's days, Memorial Day, Thanksgiving and Christmas. The holiday collection is here. Ryan is now in seventh grade (middle school) and Katie is in fifth (elementary). Ryan's pre-AP classes have been challenging, and because of that advanced curriculum, he's brought home some interesting projects, from pirate Potato Heads to Newton cars. Ryan plays trumpet in band, and Katie is loving her involvement in her school's choir. Meanwhile, I'm still teaching high school journalism and English. Some photos and stories from our school days are here. 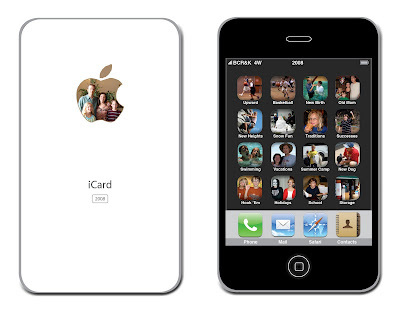 So why do we have a picture of a bunch of boxes on our Christmas card? Home may be where the heart is, but storage is where a bunch of our stuff is! We began Project GOOD (Get Out of Dodge) this year and put our house on the market in August. In September, we had a buyer who was in a hurry to get into our abode, so we were on the fast track to find a new place. We fell in love with a bigger house, had a contract on it, and started moving our junk into storage to prepare for our closing date. And then we waited. And waited. And waited. We ended up having to cancel both contracts (on the house we were selling and the one we wanted to buy) because our buyers had some financing issues. Bummer. Our house is back on the market, our stuff is still in storage, and we pray that God will give us some peace while we're living in our mostly empty house. We are so very thankful to have this problem (our stuff has its own house! ), but we're ready to know what's next. All of these events and many others have made 2008 memorable, and we are blessed beyond belief. May you and yours enjoy a blessed 2009!